1. Place your oil and popping corn in a large pan. Cover the pan and turn the heat to medium on the stove top. 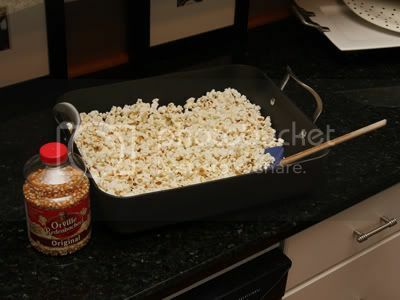 Pop your popcorn, shaking the pan slightly over the stove until popping slows. Remove the pan from the heat. 2. 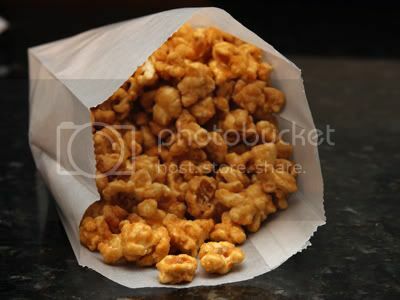 Pour your popped corn into a large roasting pan and preheat the oven to 250 degrees. 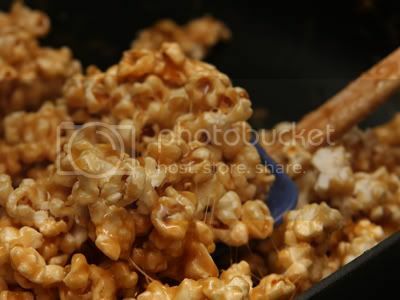 Search through the popcorn and remove any unpopped kernels - when you add the caramel, these tend to get hidden and no one wants to bite down on one! 3. In a medium saucepan, melt your butter. Over medium heat, stir in the brown sugar, the two corn syrups and a little salt. Stirring the mixture constantly so that nothing sticks to the bottom or sides, bring the mixture to a full boil. Once it starts boiling, hands off. Let it boil untouched for four minutes. 4. After four minutes, remove the saucepan from the heat and stir in your vanilla and baking soda. When you stir these two ingredients in, the dark, boiling mixture will quickly drop and become a light, foamy cream. 5. 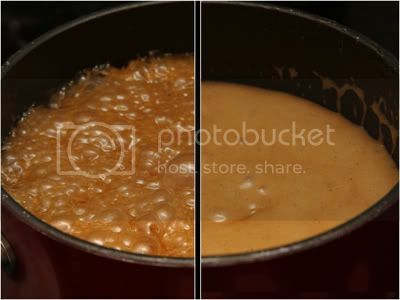 Pour the mixture over the popcorn in your roasting pan and stir the popcorn to coat all of the pieces. 6. 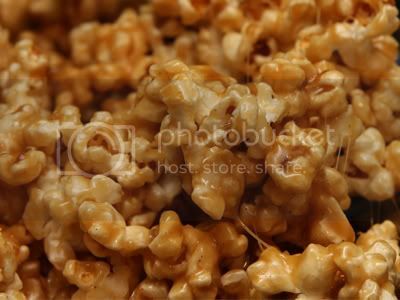 Bake the coated popcorn at 250 degrees for one hour, stirring every 15 minutes. Allow the popcorn to fully cool before your break it up to eat it. patrick wants some... 3621 Lavender Trail...etc, etc...overnight it.